Simon Hall is an author of crime fiction and a BBC Television News Correspondent. His books - the tvdetective series - are about a television reporter who covers crimes and gets so involved in the cases he helps the police to solve them. Simon has also contributed short stories to a range of magazines, written plays, and even a pantomime. 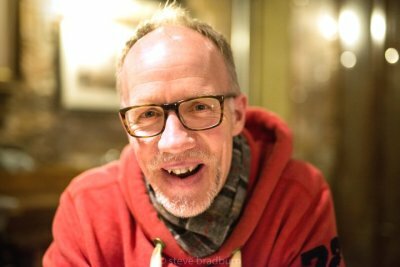 Alongside his novels and stories, Simon is a tutor in creative writing, teaching at popular Writers’ Summer Schools such as Swanwick, Fishguard and Winchester, on cruise ships and overseas. Dozens of former students say he has helped to get their work published. Simon has become sought after as a speaker, appearing at a variety of prestigious literary festivals. His talks combine an insight into his writing work, along with some extraordinary anecdotes from the life of a television reporter, including the now notorious story of What to do when you really need a dead otter. He also regularly contributes articles to publications such as Writing Magazine and Writers’ Forum. Now 48 years old, he began a broadcasting career as a DJ on the radio and in nightclubs, then moved into radio and TV news. He worked in Europe, London and Ireland before settling in Devon. Simon is married to Jess, Director of Libraries at Cambridge University, and has an adopted daughter, Niamh. She’s an army officer, which makes her father both very proud and very nervous. Simon lectures at Exeter University and College on careers in the media, as well as giving talks about the industry at local schools. Amongst his proudest achievements, Simon includes the number of young people he has helped into jobs in broadcasting, and aspiring writers into publication. As for his likes, Simon lists beer – he judges at real ale festivals – walking the countryside, solving cryptic crosswords, composing curious Tweets (find him @thetvdetective ) and studying pop lyrics. 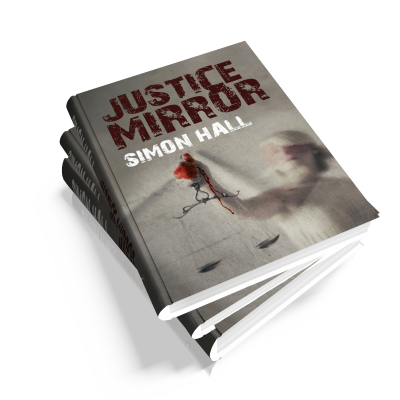 The Justice Mirror... distorted reflections of reprisals and revenge. A vicious cycle of kidnapping, suicide, and murder. A mysterious motive hinted at only by the cryptic signature PP. A double killing in which every suspect has an alibi. A crime-fighting television reporter, with an agenda driven by his own heart, is drawn into the case and faces a battle for his future to solve it. And a race through a lightning storm to trap an unlikely murderer, sworn on seeing justice done in a shocking way that history has long left behind. The Justice Mirror... there is no such thing as a simple vision of vengeance. Gripping, fast-paced and nail-bitingly tense, this thriller will leave you wanting more. Perfect for fans of Ian Rankin, Angela Marsons, Rachel Abbott and Mel Sherratt.